Native & Search Account sync is a powerful new feature extension to the Oath search family. Account Sync lets you import your Google Ads campaigns into Native & Search. 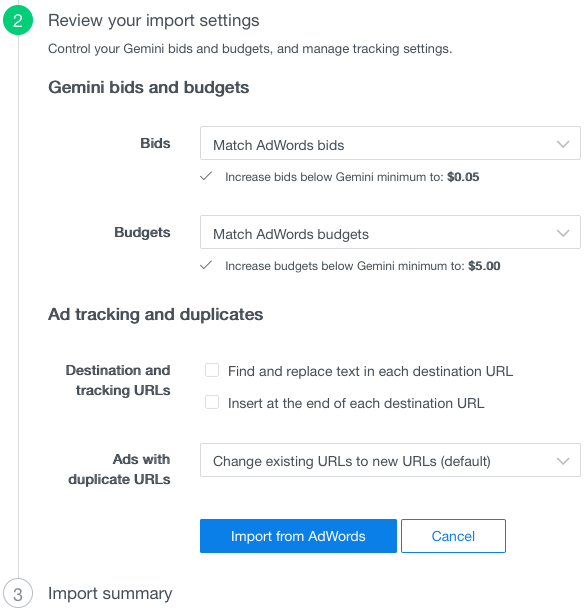 To view the ad types and categories that Account Sync can import, check out these sections: What Native & Search Account Sync Imports and What Native & Search Account Does Not Import for details. Increase your online sales through additional supply from Oath. Import your Ads portfolio (US campaigns only) with a click of a button. Control your campaign budgets and adjust your bids easily when you account-sync with Native & Search Account Sync by applying Bid and budget modifiers. Using Native & Search Account sync, you can extend the effort (read: investment) you’ve spent on Ads to drive more business results and ROI with your search campaigns. With minimal time and effort, you’ll increase volume, i.e., both traffic and impressions by running on new and additional supply from Oath. Initial account setup is super easy and straightforward. Once you complete the setup and perform the import, you’ll be able to optimize and manage your search campaigns at scale within Native & Search. Any and all changes you make on Google Ads – bids, budgets, keywords –- can be instantly reflected on Native & Search by re-initiating the Account Sync. 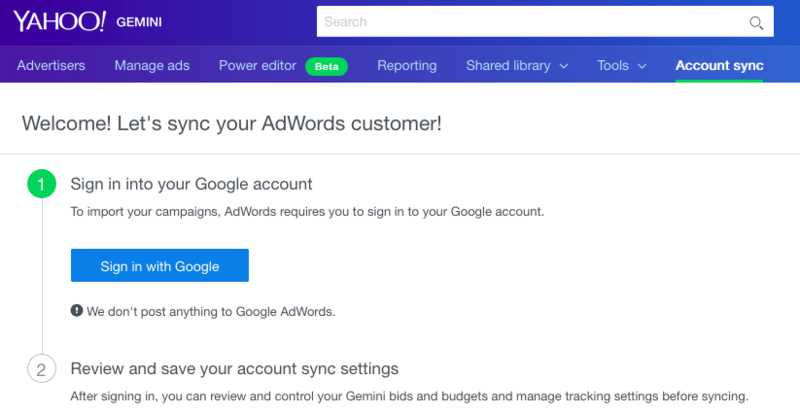 If you’re a brand new Native & Search advertiser, once you’ve created your account and launched a campaign, click the Account sync tab, and then click the Sync with Ads customer button. Once you’ve created your first Ads account sync, the system ensures that the Native & Search advertiser timezone aligns with your Ads timezone. You’ll be asked in a dialog if you wish Native & Search to manage your Ads campaigns. If you’re an existing Native & Search advertiser, click the Account sync tab and then click the Import Ads file button. 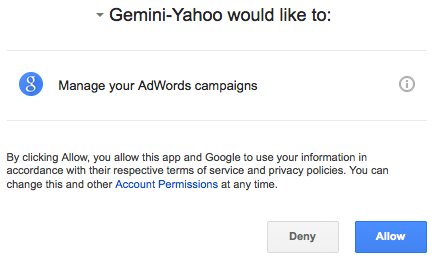 Now you can sign in to your Google Ads account and import your campaigns. Native & Search Account Sync identifies your Google Ads account with your Account name and Customer id. In the initial implementation of Native & Search Account Sync, if you’re a Google Ads Advertiser, you can associate one customer account to one Native & Search Account. If you’ve clicked Import from Ads file, you can now simply drag-and-drop your Ads bulk file in .csv format into the panel. 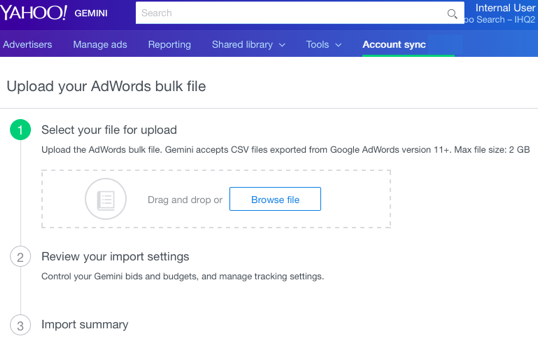 Ensure that you’ve exported those .csv files from Google Ads version 11+. The maximum file size for export is 2G. Now review your import settings. Specify bids and budgets, as well as track your ads. You can match Google Ads bids, increase or decrease those bids by specific amounts and percentages. Make your ad tracking and duplicate choices, specifying destination URLs and ads for duplicate URLs. 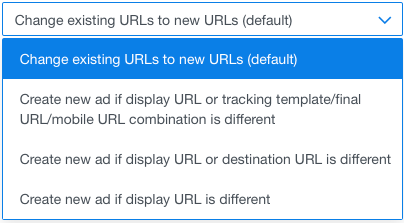 From the dropdown menu, you can also specify if you want to create a new ad if the display URL or tracking/final/URL/mobile URL combination is different. Once you’ve completed your choices, click Import from Ads. 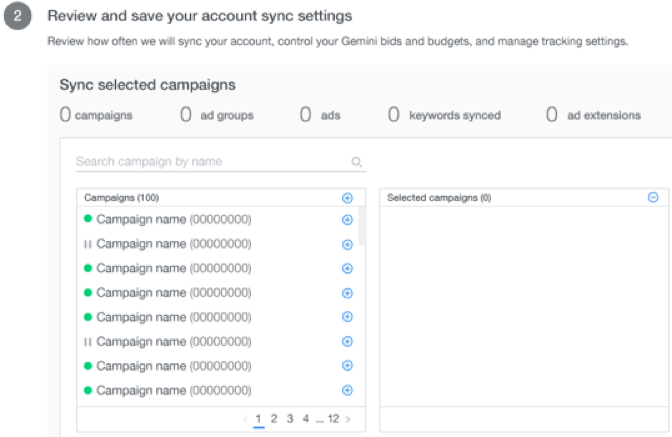 If you wish to select specific campaigns in your Ads account for sync, click the Select campaigns for sync option to import and sync with Native & Search. You can select from a list of selected campaigns. By default, Account sync imports all active Ads campaigns, ad groups, keywords and ad extensions. However, you have the ability to change that selection. All your managed ads and campaigns are then sync’d. Click from the list of campaign names. The selected campaigns will appear in the column next to your selected campaigns. You can match Google Ads bids, increase or decrease those bids by specific amounts and percentages. Native & Search Account Sync syncs your Ads account. Once that’s completed, you should set up your billing information. If you’re an existing advertiser, you can skip this step. If you’re a new advertiser, you’ll need to do this. 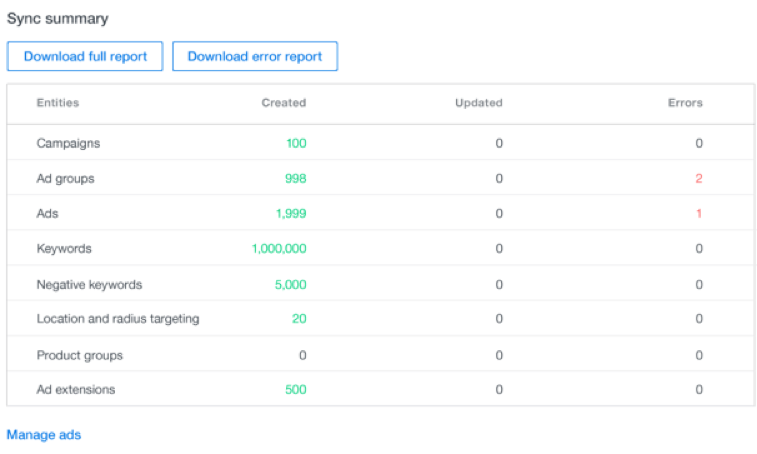 Now you can view your Sync summary, and either download the full report or download an error report for your entities. Track the history of your account syncs to monitor status. Native & Search Account Sync provides you with data on what you’ve added, updated, deleted and a report on what you’ve sync’d. Q. Is there a way to undo or un-sync an Ads account from a Native & Search account, so you can then sync to a different account? A. Yes, you can un-sync an Ads account from a Native & Search account to sync with a different account. However, the campaigns imported will remain from prior syncs completed unless you delete via the Native & Search interface. Once you sign-out, you will no longer be able to sync with your Ads account until you sign back in or sync with a different account. 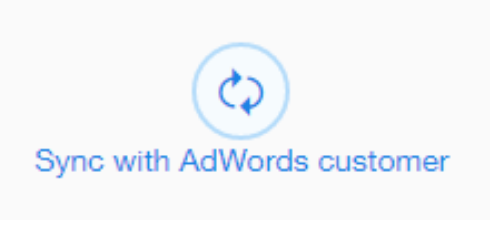 Once signed out, select the Sync with Ads customer button and select your alternate Ads account. Q. If my campaigns serve in a non-US market, will I be able to port those campaigns into Native & Search? A. No. In the current release of Account sync, you won’t be able to port those campaigns into Native & Search. In the campaign selector window, you won’t be able to select non-US campaigns. Q. Do I need to have a fresh Native & Search account or campaign to implement the Account sync functionality, or can I apply sync to an existing search campaign within Native & Search? A. There’s no need to create a new account to use Native & Search Account sync. If you have an existing account, you can use that. If there’s a conflict with campaign names across Google Ads and Native & Search, Native & Search will create new campaigns upon first sync and append a timestamp to those campaigns. Any subsequent syncs are sticky across both platforms. Be sure to review the following section to see what Native & Search Account Sync imports and does not import. Campaigns Targeting EN users only. Search campaigns only. Ads Text ads and Expanded Ads formats only. Support for 1 desktop & 1 mobile destination URL only. Note that we do not support text ads that have a device preference set to mobile. Keywords (+) Ad Group level. Keywords (-) Ad Group & Campaign level. Only supporting non-shared negative keywords. Ad extensions Campaign-level Sitelink extensions. Adgroup-level Sitelink extensions. Targeting Location targeting (Radius & Geo) at the Campaign level. DayParting. Account Sync supports Upgraded Urls, which include custom parameters. In addition, Account sync also supports Campaign-level Callout Extensions and Campaign-level Call extensions. Mobile targeting at the AdGroup & Campaign level.